"It's your turn to be the best chef in the world!" 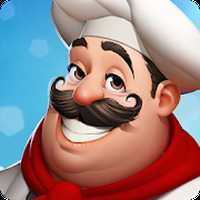 Game Goal: Become a chef to manage your own restaurant and prepare dishes from around the world in order to grow your business with increasing numbers of tables and customers. How to Play: You'll have to get the right ingredients and prepare the dishes to serve your customers, but items to decorate the restaurant and expand to attract celebrities. Graphics: All character designs, plates and objects are very simple but attractive; the game has smooth animations and great resolution. Game play: There are a variety of dishes and cooks, but it's best to synchronize with Facebook to play and ask for help from your friends or buy or sell ingredients and other items. Languages: Interface is in English and Spanish. Developer: Parrotgames is based in Spain	- Reputable developer. Installation requirements: A minimum of 66.42 MB of free memory space and Android 4.0 or higher. Rating: The TOP 5 Most popular games in Business Games category. Ranking: The TOP 5 Most downloaded games in Business Games category. There are numerous missions and objectives to complete. Lots of ingredients, dishes and objects. Has great graphics and high quality sound. It takes too long to prepare the food. there's nothing new or unique in this game. Do you like World Chef?